Arsenal defender Thomas Vermaelen is backing Belgium team-mate Eden Hazard to be a Premier League success. Hazard, 21, looks set to join Chelsea this summer after tweeting he is joining the "Champions League winner". Vermaelen is convinced the sought-after Lille midfielder will prove his worth should the Blues announce his signing. "He will do well for Chelsea and I think he will be nice to watch for the spectators when they come to the stadium," said Vermaelen. Chelsea declined to comment after Hazard, who has also attracted interest from Manchester United and Manchester City, made his claim on Twitter. But the Belgian is reportedly heading to Stamford Bridge on a five-year deal for a fee said to be around £32m. Vermaelen, 26, believes Hazard will be a big asset - whoever he plays for in England next season. "I think he is a great player," added the former Ajax player ahead of Belgium's friendly with England at Wembley on Saturday. "Technically he is one of the best in our team. I don't know if I am surprised he chose Chelsea ahead of City because I was not there behind the scenes. "He made his mind up and I think he will do well, I am convinced he will. "I am happy he came to England, I think it is good for the national team as well." Hazard is one of Europe's most sought-after talents. 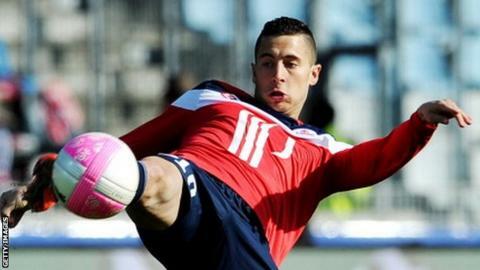 He made his Lille debut as a 16-year-old in November 2007, was also named 2012 Player of the Year in France, becoming only the second player in French football history to win the accolade two years running. This came after picking up back-to-back Young Player of the Year awards in 2009 and 2010. In 2011, Hazard also helped guide Lille to their first league championship since 1954, while 17 goals this season aided qualification for next season's Champions League.